You down with OPP – One Percent People? No I don’t mean reference to the Naughty by Nature song but rather the One Percenters that have been making the news for the past few years that was the basis of the Occupy Wall Street Movement. I go to the grocery store about every week – Costco, the local Mariano’s or ethnic grocery stores and I consider myself as frugal or at least approaching frugality (with the few occasional indulgences). It is impossible to fathom how a family of four are able to get by with what is considered as “average” salary in the US. I was watching Real Time with Bill Maher last week and he had a segment on the 1%ers and how the time to have a discussion on “Maximum Wage” in addition to “Minimum Wage”, has come. He quoted Warren Buffet – “I should write a book on how to get by on $500 million because apparently there is a lot of people who don’t know how to do it”. Also referenced was the Oxfam Report in his New Rules segment – “the 85 richest people, 85, own more (wealth) than the bottom three and half billion put together, which is half the planet”. Personally I support capitalism, as it is one of the best engines for innovations and growth . Yes you need the wealth creators to sustain/grow innovation and job growth. But there is a level of perversity that comes with the Oxfam statistic that is French Revolutionesque. Maher is also quick to pay accolades to the current crop of socially responsible billionaires who have pledged all or most of their net worth to charitable causes (The Giving Pledge). Social Security Administration’s 2012 report shows a sobering statistic. The key summary is as follows – The “raw” average wage, computed as net compensation divided by the number of wage earners, is $6,529,097,960,690.75 divided by 153,632,290, or $42,498.21. Based on data in the table , about 67.1 percent of wage earners had net compensation less than or equal to the $42,498.21 raw average wage. By definition, 50 percent of wage earners had net compensation less than or equal to the median wage, which is estimated to be $27,519.10 for 2012. (Reference – http://www.ssa.gov/cgi-bin/netcomp.cgi?year=2012) . Also, over the past 40 years, wealth gains for the top 1% completely dwarf the gains for the remaining 99%. The problem of income equality is real both in the US and globally and needs to be addressed. All indications point to this issue being a campaign point in the upcoming mid term elections and also in the 2016 Presidenial elections. What are some of the options? – controls in executive compensation, Tax reforms, not more but “optimal regulations’ are all being kicked around. Obviously, I am not an economist, policy wonk or part of the 1% club. At the end of the day there is the real issue when you see people struggling to get by every day. You talk to people at work who have no savings cushion, borrowed – in debt to the hilt or folks who have lost their jobs and are struggling- the working poor and out of work poor! So here is my question. While this whole debate continues and solutions are being looked at can we”increase” the use of our tax money we are spending to help ameliorate our poor? Here is a thought — Cut defense spending and reallocate it. I know I know this has been bandied about for a while and this year’s defense budget from Hagel is a good start. But c’mon do we need to spend this much money on our defense (and the answer can’t be we need to protect the freedoms of the world). What about the freedoms of our citizen who deserve a decent standard of living? Don’t get me wrong this is not a progressive rambling, I am in fact conservative on a lot of issues. 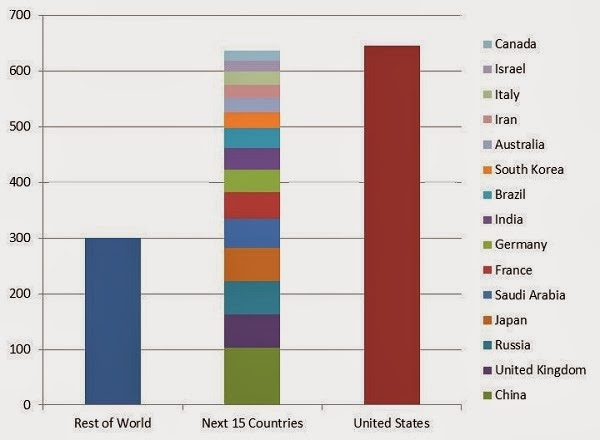 The chart below shows that the US spends as much in defense as the next 15 countries COMBINED! are in the Empire Building business”. We don’t leave anywhere we go”. Our threats in the 21st century are not the traditional wars we have fought in the past, rather disparate groups and organizations with stateless affiliations. We don’t need to build F-35s and Tanks or weapons that will never be used (even the Military is crying that they don’t want anymore!). Will we become less safe if we spend (say) the total defense budget of the next 6 or 7 countries combined instead of 15? I don’t know the answer but it is frustrating when we can send money to support meaningless wars when we can spend it on programs that can make an impact stateside. So while we figure out how to improve upward mobility and reduce the income disparity can we at least make a small and immediate impact in improving the lives of our citizens? Maybe the first step in being the “world’s police and beacon of freedom” is to take care of our own first? Now that may be a novel thought!